Home to one of the most iconic and enduring images of Kyrenia, North Cyprus. The small but beautiful village of Bellapais sits high on the side of the Kyrenia mountains just to the north east of Kyrenia. It is a village of narrow streets and full of charm but the major attraction lies at the very heart of the village, Bellapais Abbey. 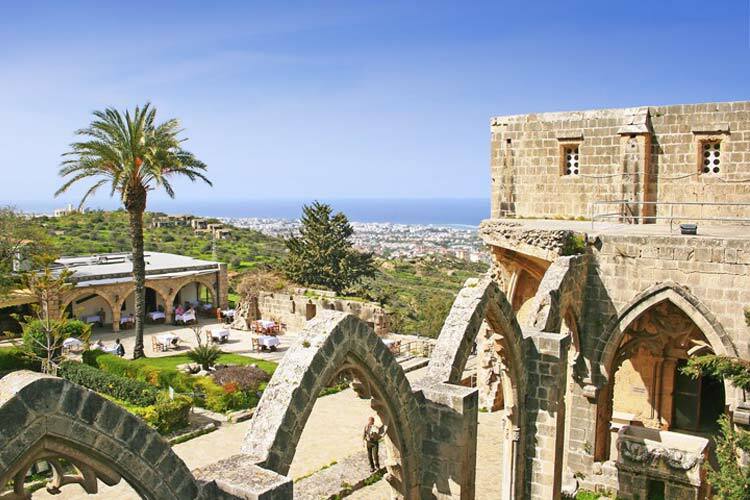 This sturdily built 12th century Abbey is graced by towering, slender gothic arches, a picture in themselves and one of the enduring iconic images of North Cyprus. Bellapais Abbey is believed to be a derivation of the French name 'Abbaye de la paix', Abbey of peace. Back in 1298 when the construction of the abbey started this must have been a really isolated and tranquil spot which attracted the Augustinian monks forced to flee Jerusalem by the Saracens. In all probability it was founded by Amaury de Lusignan, King of Cyprus at the time. King Hughues III was a great benefactor and built further additions in 1267 shaping its present appearance except for the gothic refectory which was added by his successor, King Hughues IV, in the following century. For a time it accepted the Nobertine rule which required the monks to wear white so it became known as the White Abbey. Its rich treasury, believed to have contained a fragment of the True Cross, was looted by the invading Genoese in 1373 which led to the abbey's gradual decline. Later, in 1570, it was sacked by the Turks and left in ruins. With all this raw material at hand, it wasn't long before the locals were recycling the stone to build houses and create a village. Visitors today can enter through an arched and fortified gateway to see, immediately opposite, the oldest part of the abbey, the well preserved 13th century church. Beyond the church lie the cloisters with their delicate gothic arches. On the northern side is the large refectory which is now used for classical concerts, particularly in May when the music festival is held. The village itself is a popular tourist attraction made more famous by Lawrence Durrell who lived here from 1953-6. His book, 'Bitter Lemons of Cyprus' was both a comic and serious account of his life in the village and unfolding dramas in the Cypriot drive for union with Greece, 'enosis'. Visitors are still trying to identify the Tree of Idleness, the mulberry tree which shaded him while he relaxed with a drink. His house, suitably named Bitter Lemons, lies up the hillside to the south but has been extensively modified since his day. Please do this simple math: 2 + 2 = ?